our watercolor unit has begun and i'm already seeing incredible and subtle work from our students. we are covering basic techniques, focusing on high contrast multi-color washes, and working with value to realistically depict objects found in nature. Students will also have plenty of opportunity to experiment with more impressionistic techniques. the self portrait unit produced some incredibly expressive results. We are in the final stages of our letter morphing project. Silver and gold tempera are the coolest colors! for every positive space drawn, a negative space is created. working with typography is a great way to explore this phenomena. students are starting by creating "positive" and "negative" letters. once they see negative spaces, they can begin to manipulate them to serve specific artistic purposes. in phase II, students will play with positive and negative spaces to create unique letters and logos. We have moved into sculpting with clay. Now that students have an understanding of primary/secondary/tertiary colors, they can appreciate the full spectrum of possible color combinations to use once the sculptures are ready for painting. we started with holiday ornaments as a warm up so, hopefully, many of you received a beautiful gift over winter break. 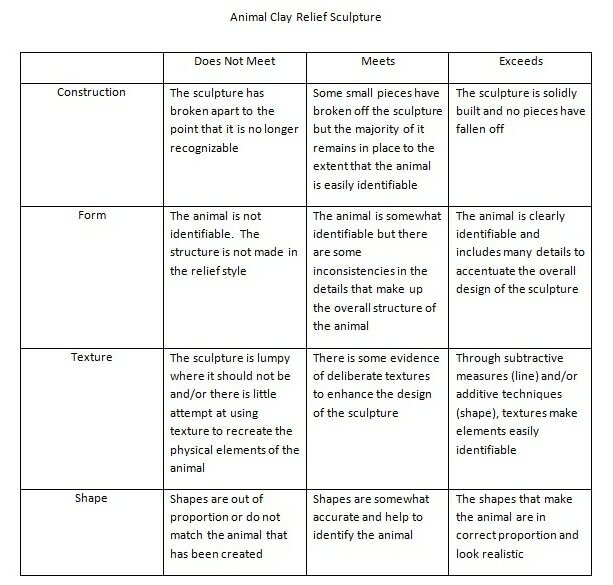 we are now producing animal relief sculptures focusing on form, shape, and texture. i reinforce with students that we do two things in class - make art and talk about art. 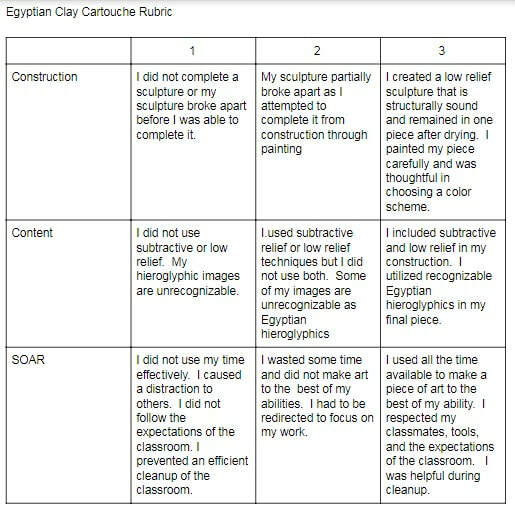 by learning the formal elements of art, students will be able to EFFECTIVELY assess their own work using the language of art. included here is a photo of some wonderful sculptures made before the holidays AS WELL AS THE CONSTRUCTION RUBRIC STUDENTS WILL USE TO ASSESS THEIR WORK. ​inspired by a trip to the National Museum of Mexican Art in Pilsen, students are close to completing Mexican Folk Art inspired pastel pieces. drawn on brown construction paper, these colorful images are rich, vibrant, and it has been very exciting to watch them come to life. messy? Yes, but worth it! ​the stencil project did not DISAPPOINT. the hardest part for me was letting students take these pieces home. i held on to a few for for our school's permanent collection. when seen together, these pieces look beautiful. 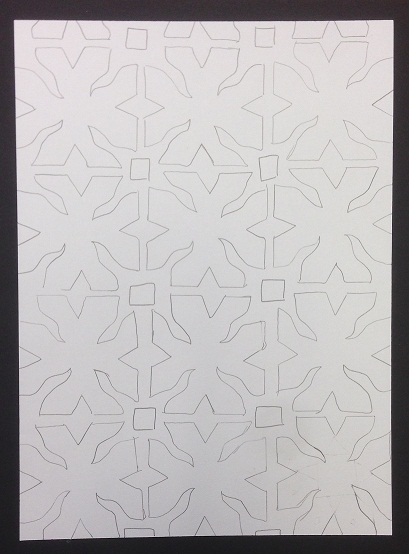 below is an example of a completed stencil project with color. our students are currently working on Mexican Folk art using oil pastels. these pieces utilize balance, free-hand drawing, and color combinations that leap off the page. as they near completion, i will post some photos online. i look forward to framing several of these and adding them to our permanent collection.